It was just a typical day in Katipunan when I saw something that wasn’t there before. As a coffee worshipper, I thought it was a new coffee shop so I got excited and went closer. To my surprise, it was a barbershop! 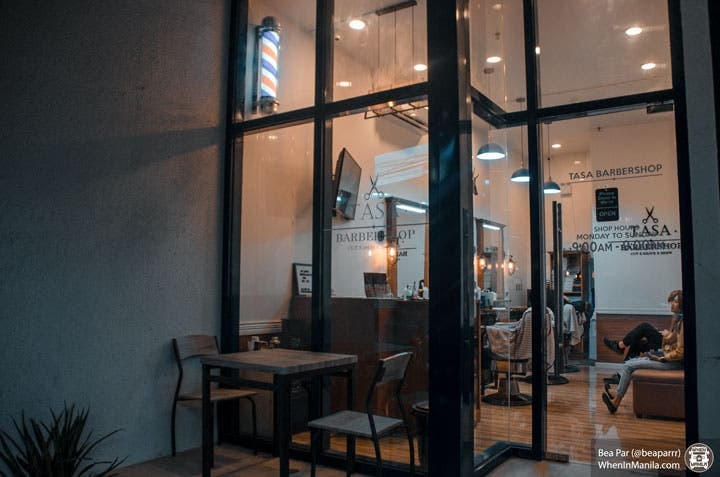 Tasa, pronounced either as the Filipino word for sharp or the Filipino word for cup, is an upscale boutique barbershop in Katipunan that promises excellence and precision. With their tagline “cut x shave x brew“, they’re more than just a barbershop. They’re a place where men can get pampered after a hard day’s work. Anyone can enjoy Tasa’s services, but since I’m a woman who prefers spas and salons for my own personal reasons, I’m glad I got the perfect (literally?) person to try Tasa’s services. It’s a struggle for many working gentlemen in the Metro to find time for self-care. Most of the time, men opt for quick trips to the barbershop to look neat; but no matter what one’s preference is, Tasa has a service suitable for anyone. From baby to bae real quick! “This is the best haircut that I’ve had in my life. I probably had a few really great haircuts before; but here, the service is 10/10. I think the best thing about it is that the barber is really passionate with what he does and the results show. 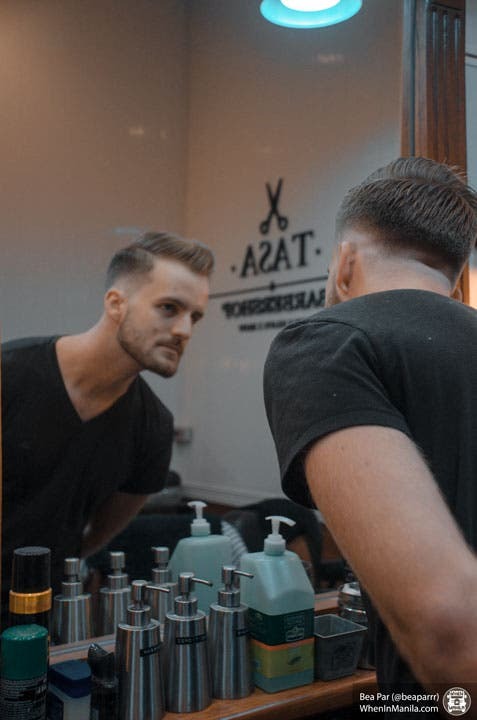 I went in here with such messy hair; but after the service, even without wearing a suit and tie, I walked out of Tasa feeling very confident about myself,” shared our friend who tried Tasa’s services for the first time. Tasa opened late last year; but because of their aesthetic appeal and excellent service, it was easy for them to be talked about by gentlemen around the area in no time. Tasa gives a very professional yet welcoming vibe upon entering. Complementary coffee and/or tea is served to customers while they wait for relaxation. In an exchange with the owner, Kadjo Sarabia, we found out that most of the furniture pieces in the shop are locally made. Even the barber chairs are made by the great hands of the artisans from the City of Marikina. He also shared his keen attention to detail as he wants to make sure that every customer feels their best when they visit Tasa. Kadjo has great appreciation for grooming. One time, when he was sitting on a barber’s chair getting a haircut, he had such a wonderful experience because the barbers’ passion with their craft was radiating. That moment inspired him to share how easy it can be to feel like a real gentleman. When we visited, Kuya Gino was the barber who attended to us. We found out that he has been doing this since he was 10 years old and you can definitely see the fire burning in his eyes while he’s doing his craft. It’s definitely one of the reasons why clients keep coming back. When we visited Tasa, one thing that I noticed is that every gentleman automatically gets a confidence boost the moment they stand up from their chairs. So ladies, why not try switching roles with your man and take them to Tasa to get pampered? 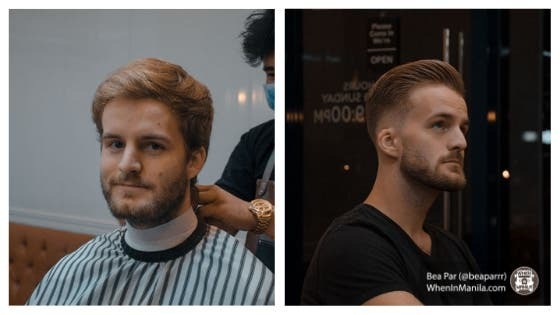 After hours of amusing yourself with the amount of hair products that men have, I’m pretty sure you’ll say the wait was worth it after you see him after his haircut! LOOK: Nadine Lustre Now Has Her Own Make-Up Line!